This is a very sad blog for us to post. As a part of a new series we are featuring people that have been to Vale House Kitchen, acquired new skills and then gone on to use them in their life. Paul Young was one of those people. The day that this was originally going to be published Paul was tragically killed in a motorbike accident in Somerset. A truly charismatic and larger than life figure we had got to know Paul through his visits to Vale House Kitchen and socially out in the field on various shooting trips. He was truly passionate about the new business he was establishing at The Rusty Pig in conjunction with Robin and we know he would have gone on to make a huge success of it. He was a firm believer that its never too late to start a new career and wanted to inspire people to take the plunge and have a go at something different. Having consulted his family they have asked us to publish this post as a tribute to him. Paul you will be greatly missed by everyone who knew you. ‘Welcome to a new series on the Vale House Kitchen blog. We always love meeting the people who choose to come on our courses, and over the past three years we’ve had some fascinating folks join us who’ve gone on to do brilliant things with the knowledge and skills they acquire. Paul Young is one of those people, getting inspired by a course at Vale House and making a complete career change as a result. Formerly a geologist with 25 years in the mining industry, working all over Africa, Paul was given a voucher for a butchery course as a Christmas present. It piqued his interest in charcuterie, and he quickly got stuck in at home. 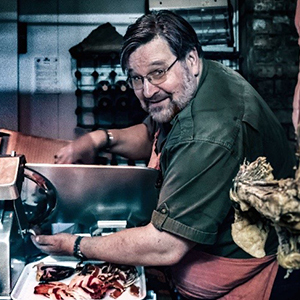 It also introduced him to our butchery tutor Robin, from the Rusty Pig, a fabulous restaurant in Ottery St Mary specialising in all things deliciously piggy. Paul went on to experiment with all sorts of recipes, and having had a go at selling his creations at the church fete, started to wonder if he could make a living out of it. He went back to the Rusty Pig for some advice, and it turned out Robin was looking for a partner to help develop a retail side to the business, to accompany the restaurant. Now Paul helps create delicious, small-batch charcuterie for visitors to the Rusty Pig to take home – and they’ve got plans to develop the wholesale side too, supplying other restaurants and caterers.